Pear drop golden rutilated quartz pendant. Sparkling across the many facets on the face of this gemstone, this golden rutilated quartz pendant is a beauty. Inside the quartz you can see suspended golden Venus hair - fine needles of rutilation. Each gemstone has its own unique configuration of needles. This special gemstone is claw set in sterling silver. The chain we feature with this golden rutilated quartz pendant is our silver snake chain, width 2mm. 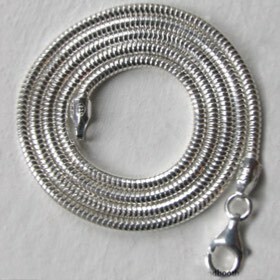 For a wide choice of chains, see our collection of Italian silver chains.